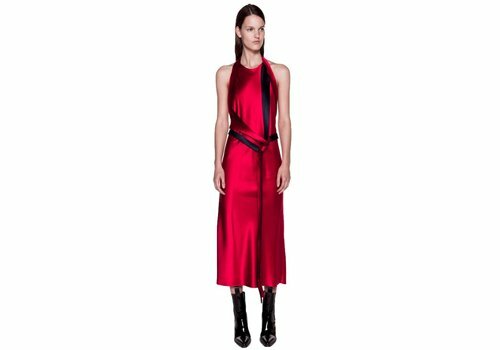 The Corrugated Pleat Dress from Dion Lee is a sleeveless wrap front midi dress featuring corrugated pleat panels along each side. The waistband at the sides loop through two silver rectangle rings and allows wearer to adjust and tighten the waist as fit. 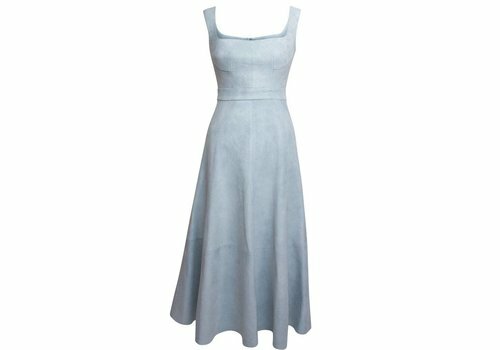 Grosgrain wrap front midi dress that is fully lined with two silver rectangle ring loops, button inside the right hand side wrap and belts that can be tightened to cinch dress across the bust and waist. 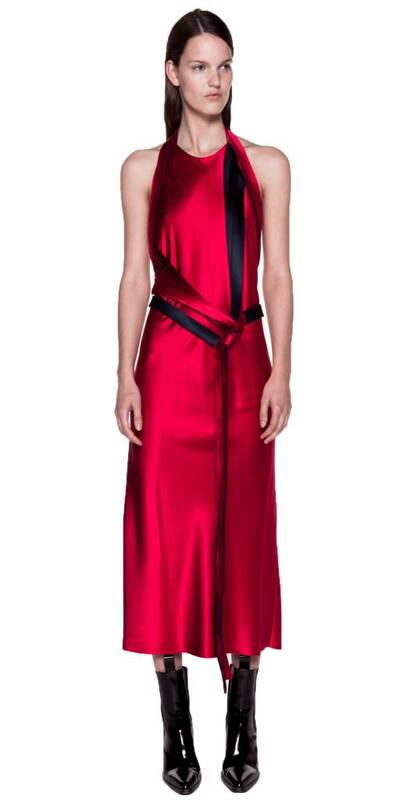 The Silk Bias Weave Dress from Dion Lee is a body skimming silk slip dress with woven diagonal bodice. 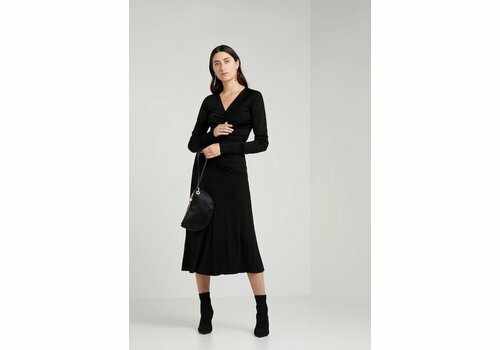 The Cady Tessellate Long Sleeve Dress from Dion Lee is a cut out midi dress featuring double layer overlays in front of the dress to form the center front cut out. 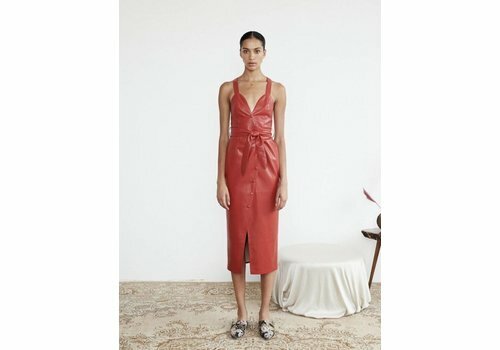 The Net Pleat Strapless Dress from Dion Lee is a strapless fitted bodice dress constructed from a bonded crepe and featuring a pleated mesh fabric panel from lower hip to hem. 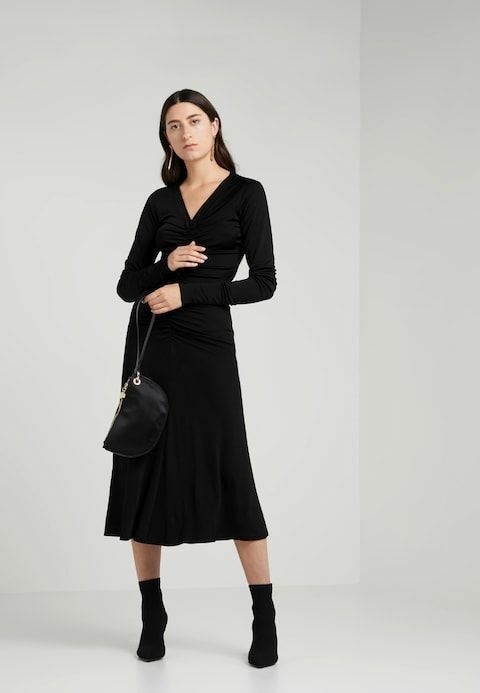 The Twist Sleeve Drape Dress from Dion Lee is an asymmetric silk dress featuring a single sleeve, draped twist and front slit. 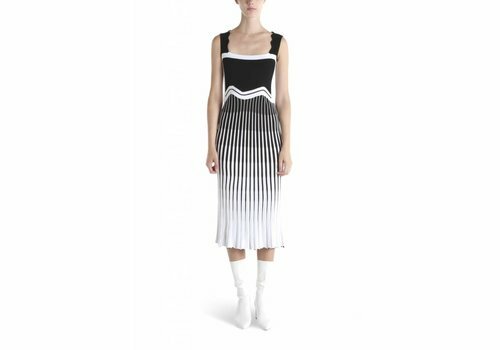 The Check Bias Weave Dress from Dion Lee is a body slimming bias cut slip dress with woven diagonal bodice and invisible side zip closure. The enchanting simplicity of this dress allows the hand stitched detailing at the bust to be admired. A fitted bodice with a full A-line skirt flatters the waist, while the thoughtfully constructed cups shape the bust. 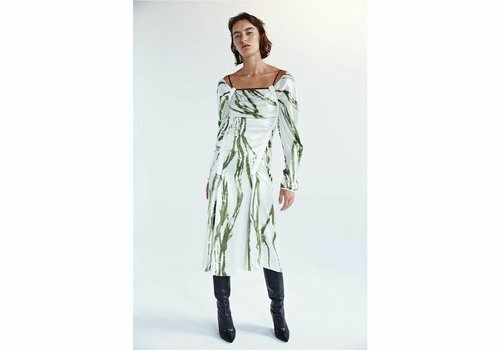 The Incline Taped Longsleeve Dress from Christopher Esber is constructed in fluid silk satin, featuring an exclusive Alpine print, convertible sleeves to off shoulder, adjustable contrast straps, ruched detail with grograin accents through body. 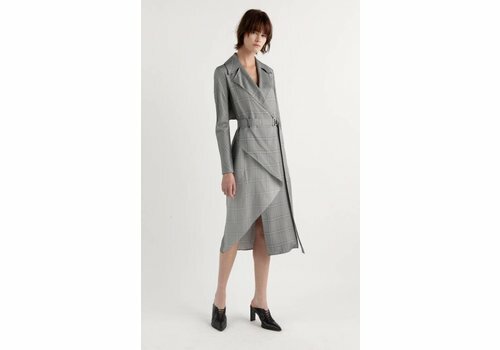 Bias cut dress from Georgia Alice in an abstract acid silk-cotton print featuring a flared raglan sleeve, subtly fluted hem and hidden zip fastening down center back. Made from the Nanushka signature lustrous vegan leather, this style is last season’s bestseller Santal dress rethought, with an edgy twist. The wrap-front style drapes easily across the body and ties at the hip with a scarf wrap. 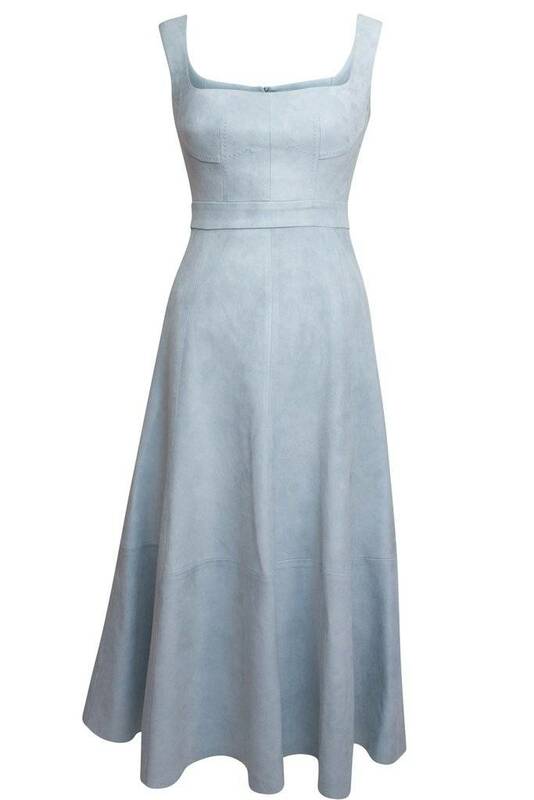 By Malene Birger's stretch-crepe dress is detailed with a central gathering that drapes beautifully. 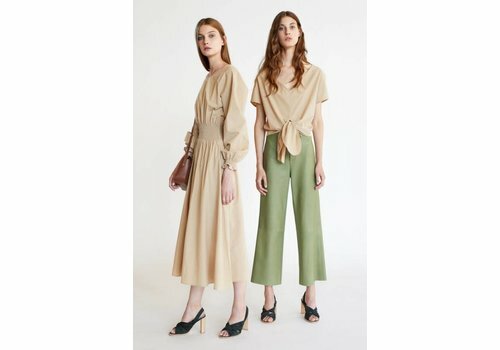 The tight-fitting style has a deep V neckline and flares gently from the hip. 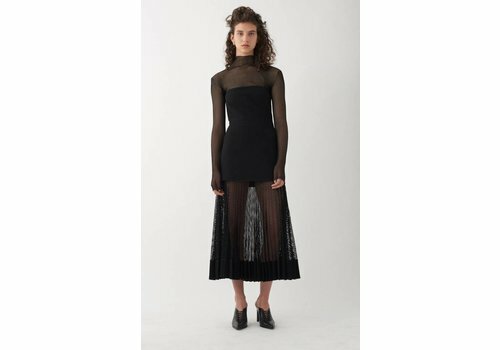 The Dion Lee Suspended Lace Spiral Sleeve Dress features a cold shoulder and sheath silhouette. 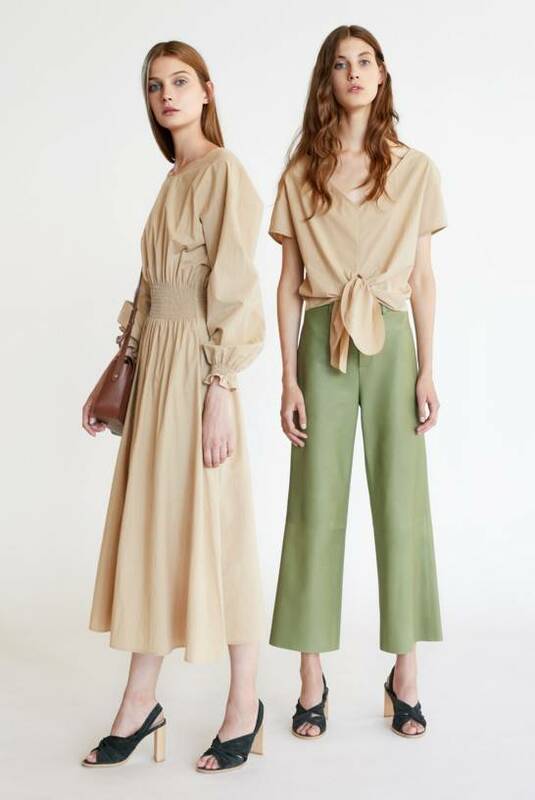 The Áeron Gathered Waist Dress is a maxi dress cut from 100% cotton with billowy sleeves and gathered elastic waist that cinches a relaxed silhouette.